Our galaxy (the Milky Way) lies among hundreds of billions of other large galaxies that constitute the universe, and in itself contains several hundreds of billions of stars… our sun being one of them. Similarly to all stars, the mass of the sun is so large that the atoms compressed at its center are subject to reactions of nuclear fusion whose power equals to 3.826 х E26 [W]. This energy is radiated towards space as electromagnetic radiation such as visible light. 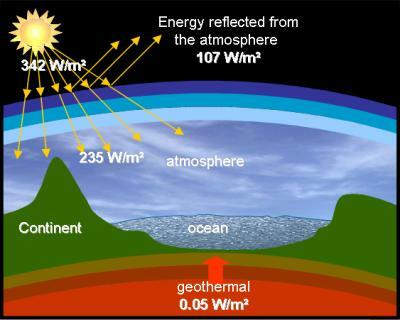 A “tiny part” of the radiated power (1.744 х E17 [W]) reaches the atmosphere of our planet at a rate of 342 [W/m²](*). (*) Averaged over a one year period and scaled to the total ground surface of the Earth (continents and oceans). 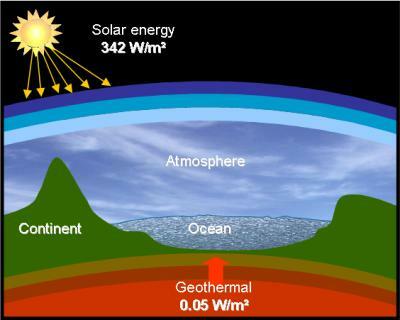 Out of the 342 [W/m²], 30% is reflected towards space, and 235 [W/m²] contribute to the thermal equilibrium of our planet. Données : site du CNRS, dossier Climat, systèmes et facteurs climatiques, effet de serre. In comparison, the energetic power we as humans produce and consume seems very little, in the order of 1.5 х E13 [W] in 2008 (which is 0.03 [W/m²]). This corresponds to 1/10000th of what we receive from the sun. If the anthropogenic energy production is no longer negligible since it represents for example more than 50% of the heating power we receive from the center of the Earth, it is in itself not sufficient to understand Global Warming. The astronomic position of the Earth relative to the sun is the principal component of natural variability. The major cycles depend on the variation of the eccentricity of the earthly orbit (100,000 year-long cycles), the obliquity of the ecliptic (approximately 41,000 year-long cycle) and the precession of the equinoxes. Solar activity also fluctuates based on the number of sun spots. These spots are responsible for variations in the intensity of solar activity. Eleven year long cycles superimposing themselves to longer periods (200-300 years) have been identified. 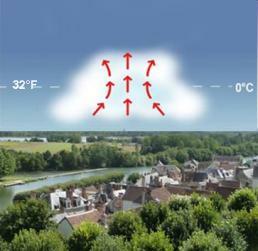 Source: “les indices du réchauffement climatique” IFEN, n° 102. Evolution of continental and oceanic temperature between 1880 and 2007 [°C]. 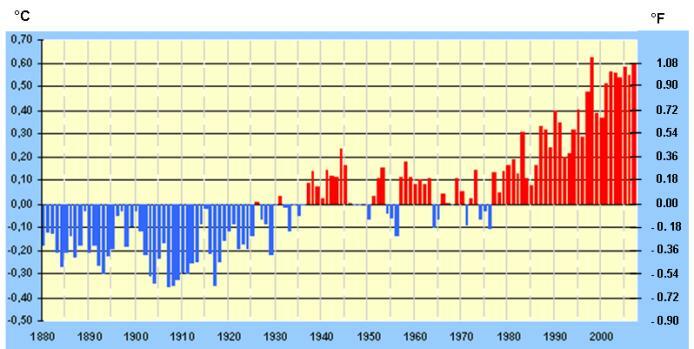 What was the increase in surface temperature between 1905 and 1945? Increase in temperature at the surface level between 1905 and 1945: approximately 0.4 [°C] (0.4 K). Increase in temperature at the surface level between 1975 and 2005: approximately 0.6 [°C] (0.6 K). Therefore we still need to understand why our “small activity” could potentially induce a temperature increase predicted to range between 1.5 and 4 [K] over the next 80 years, the consequences of which could only be catastrophic.